With a stay at Ancora Punta Cana, All Suites Destination Resort in Punta Cana, you'll be 2.2 mi (3.5 km) from Juanillo Beach and 5.8 mi (9.4 km) from Punta Espada Golf Course. This 4.5-star resort is 10.5 mi (16.9 km) from Downtown Punta Cana and 10.6 mi (17.1 km) from San Juan Shopping Center. Make yourself at home in one of the 300 individually decorated guestrooms, featuring kitchens with full-sized refrigerators/freezers and stovetops. Rooms have private balconies or patios. Wired and wireless Internet access is complimentary, while 32-inch LCD televisions with satellite programming provide entertainment. Private bathrooms with separate bathtubs and showers feature deep soaking bathtubs and designer toiletries. Practice your swing on the golf course or dip into one of the 4 outdoor swimming pools. This resort also features complimentary wireless Internet access, concierge services, and babysitting/childcare (surcharge). Getting to the surf and sand is a breeze with the complimentary beach shuttle. Enjoy Italian cuisine at Il Cielo Ristorante & Bar, one of the resort's 6 restaurants, or stay in and take advantage of the 24-hour room service. Relax with a refreshing drink from the poolside bar or one of the 4 bars/lounges. Featured amenities include complimentary wired Internet access, express check-out, and complimentary newspapers in the lobby. A roundtrip airport shuttle is provided for a surcharge (available 24 hours), and free valet parking is available onsite. All-inclusive room rates at Ancora Punta Cana, All Suites Destination Resort are available. These rates are higher because they include onsite food and beverages in the room rate (some restrictions may apply). Some rates at Ancora Punta Cana, All Suites Destination Resort are all-inclusive. These rates include onsite meals and beverages, and may include taxes and gratuities. Additional charges may apply for meals at some restaurants, special dinners and dishes, certain beverages, and other amenities. 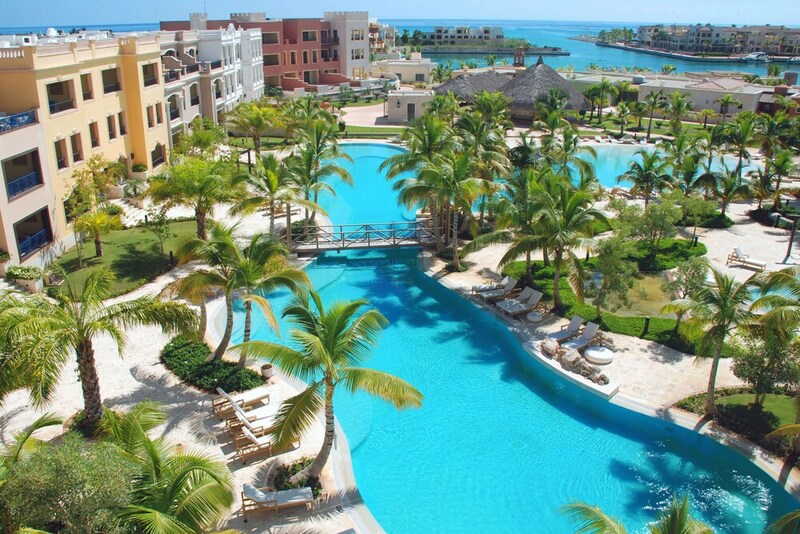 Ancora Punta Cana, All Suites Destination Resort features a golf course, a marina, and 4 outdoor swimming pools. Dining is available at one of the resort's 6 restaurants. The property also offers a snack bar/deli and a grocery/convenience store. Guests can unwind with a drink at one of the resort's bars, which include 4 bars/lounges and a poolside bar. Wired and wireless Internet access is complimentary. This luxury resort also offers a children's pool, a health club, and a terrace. For a surcharge, the property provides an area shuttle within 10 miles and a roundtrip airport shuttle (available 24 hours). Complimentary self parking and valet parking are available on site. Ancora Punta Cana, All Suites Destination Resort is a smoke-free property. Il Cielo Ristorante & Bar - Overlooking the ocean, this restaurant specializes in Italian cuisine and serves dinner only. Guests can order drinks at the bar and enjoy alfresco dining (weather permitting). Open select days. Bossa Nova - This steakhouse specializes in Brazilian cuisine. Guests can enjoy alfresco dining (weather permitting). Open select days. Kokomo's Bar - This bar is located by the pool. Guests can enjoy drinks at the bar. Happy hour is offered. Open select days. The Dock Bar - Onsite lobby lounge. Happy hour is offered. Open daily. Festivale - This restaurant specializes in local and international cuisine and serves breakfast, lunch, and dinner. Open daily. Guests can play rounds at the 18-hole golf course and enjoy other recreation facilities including a marina and a health club. 4 outdoor swimming pools are on site along with a children's pool. Other recreational amenities include a fitness center. This property offers transfers from the airport (surcharges may apply). Guests must contact the property with arrival details 24 hours prior to arrival, using the contact information on the booking confirmation. Children 3 years old and younger stay free when occupying the parent or guardian's room, using existing bedding. The property has connecting/adjoining rooms, which are subject to availability and can be requested by contacting the property using the number on the booking confirmation. This property allows pets in smoking rooms only (surcharges apply and can be found in the Fees section). Guests can request one of these rooms by contacting the property directly, using the contact information on the booking confirmation. Free WiFi in public areas has a 2-device limit.